The nation’s medical schools have too few black male medical students. That’s the cold, hard reality according to the Association of American Medical Colleges, which found that the number of black men enrolled in U.S. medical schools declined from 1978 to 2014 — from 542 to just 515. Now, the David Geffen School of Medicine at UCLA and a handful of other medical schools are aiming to change that dismal reality with an unprecedented video outreach campaign. With video profiles of young black doctors, the campaign aims to inspire underrepresented minority students to consider becoming physicians. The UCLA videos will be prominently placed on the school’s website, disseminated via social media and shared by the medical school’s community engagement groups, as well as other outreach groups affiliated with the school. The project is focused on black men because the total of black men enrolled in U.S. medical schools has actually fallen over the years, according to the 2015 AAMC report, Altering the Course, Black Males in Medicine (PDF). Further, among ethnic groups, the proportion of male-to-female medical school applicants is lowest for African-Americans. The AAMC report not only included data about the dwindling numbers of black male medical students, it cited likely reasons for the decline — among them, a lack of role models and negative portrayals of young black men in the media. The initiative began in 2013, with the Geffen School of Medicine as the fifth school to participate — and the first on the West Coast. Reaction to the campaign’s earlier videos on Facebook and from current Geffen School of Medicine students so far has been positive. And small wonder. The videos themselves are sophisticated, well-told stories about passionate men trying to make the world a better place. The two participating UCLA physicians exemplify a commitment to medicine, to other young black men and to their communities. 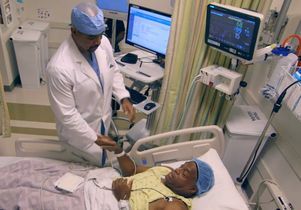 In one of the videos, Dr. Olawale Amubieya, who completed his internal medicine training at UCLA and is a fellow in the department of pulmonary and critical care medicine at Ronald Reagan UCLA Medical Center, speaks about the support network awaiting prospective medical school applicants. In another video, Dr. Stanley Frencher, an assistant professor-in-residence at the Geffen School of Medicine and the director of surgical outcomes and quality for Martin Luther King Jr. Community Hospital, relates a common refrain he hears from patients. “I can’t tell you the number of times that I take care of a patient here in the clinic who are like, ‘I’m really glad to see brothers like you as doctors here in this hospital,’” he says. But the videos are not an isolated effort. The Geffen School of Medicine has a number of other initiatives in place aimed at increasing minority enrollment — including working with community groups to spread a message of inclusiveness and opportunity, and encouraging school groups that advocate for awareness and health access. The school also is committed to a Faculty Diversity Strategic Plan that it developed to ensure that it recruits and nurtures faculty from diverse backgrounds. Impact is what the Black Men in White Coat videos are all about. By sharing the videos and their messages of inspiration, confidence and passion, the school’s leaders and the campaign’s organizers are confident they’ll help shape a new narrative for young black men in America. The videos are being released during Black History Month, which both honors the past and instills hope for the future.